I’m kind of freaking out about the fact it’s been over a month since we returned from our trip and I’ve not mentioned it on here yet – but I’ve been a bit distracted by the return to work…..but it also means it’s been nearly two months since we left on our post treatment holiday. Gulp. Lets see how much I remember…..
It’s a trip I’m yet to decide whether it was the best or worst timed holiday ever. (Lets say 80% the best timed, 20% the worst.) Flying less than 24hrs after finishing radiotherapy might not have seemed like the ideal plan to some (including my onc team) but in a lot of ways it helped with the lost feeling I know a lot of people get when they finish treatment. I had something else, other than not having to go to the hospital to focus on. Namely being a first class wanker! Yup, that’s right, in case you didn't see it on Instagram, we jetted off on our trip first class! I'm sorry the pics on this post are so terrible. I felt really conspicuous taking pics in the lounge and on the plane - like I was the person that had never flown first class before! But enough of that – let’s get started on the first class travel aspect. 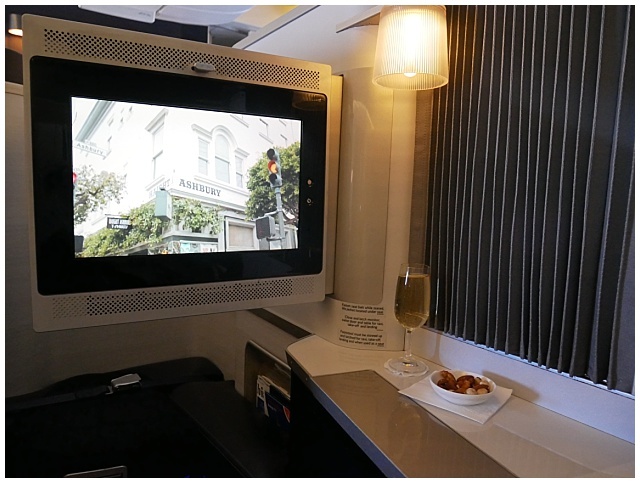 Before we flew, I read a lot of people snubbing BA’s first class and business class offerings, but as someone who thought world traveller plus was lovely and gets excited with lounge access, I have just one thing to say to you – GET A BLOODY GRIP. You’re flying first class. You’re beyond lucky to have the means to do this (most of the reviews I read did it on airmiles too so they weren't even paying actual money) – stop being such a snob and enjoy it. Enjoy it for the stupid luxury it is. Because it is luxurious. So this isn't a review, more a look at how the other half live from the point of view of a cattle class flyer! Lounge access at the airports has been one of the best things about Jim’s frequent flying – the free food and drink whilst you wait, charging points and comfy seating are a godsend, but the Concord Lounge at Heathrow was a whole step up from this. 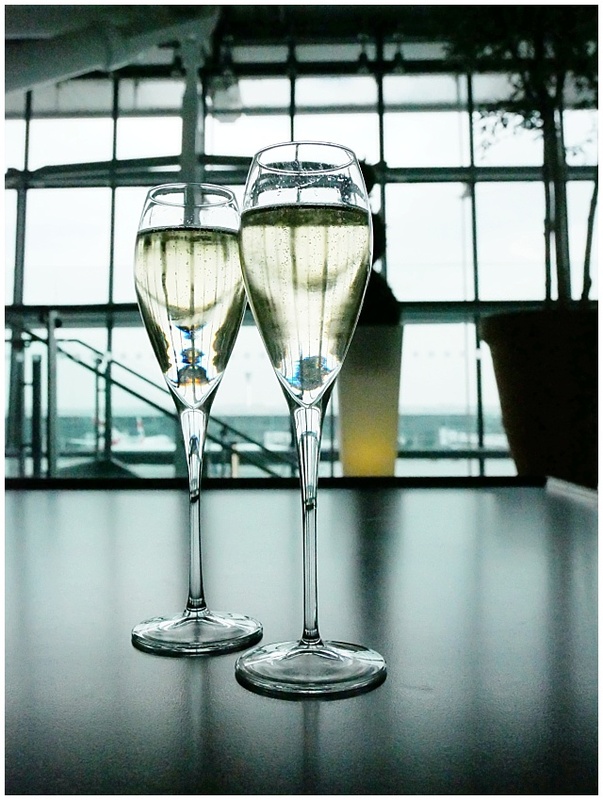 For one it felt decidedly un-hurried and airy compared to the business class lounge. And secondly, there was a guy bringing round champagne, Laurent-Perrier Grand Siecle to be precise, every time our glass got vaguely near empty. 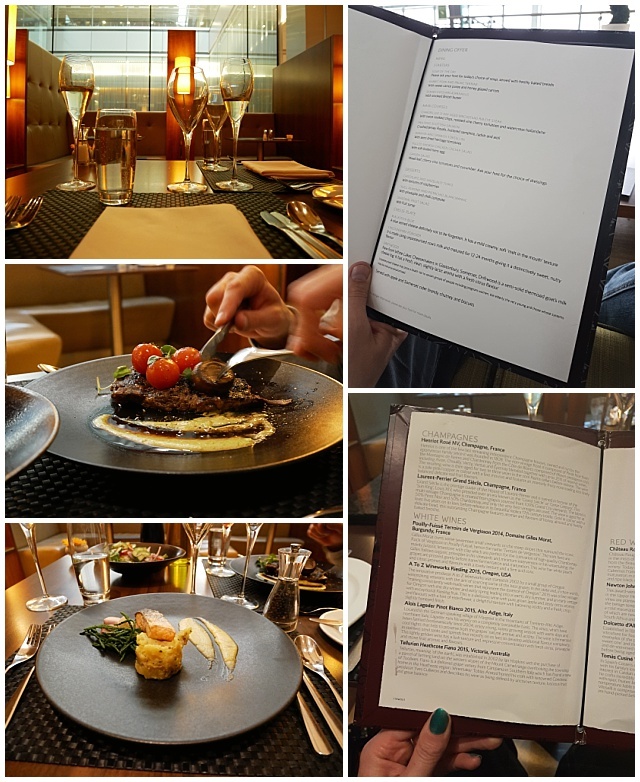 Plus, as wonderful as the all you can eat M&M's in the business class lounge are, they really don't compare to the sit down restaurant in the lounge, with private booths and a little dining menu. Jim was a little disappointed with his steak (he is super fussy), but my salmon was delicious! 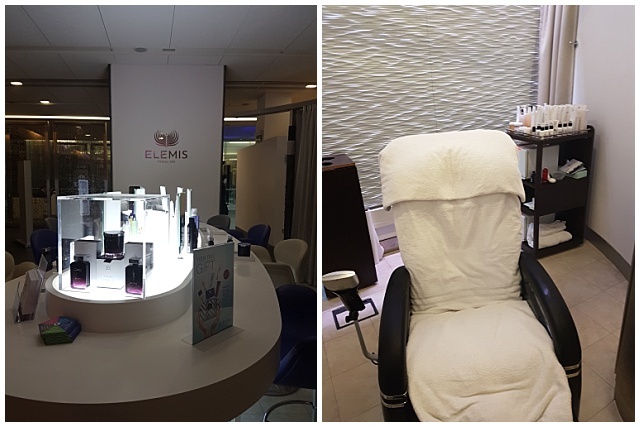 The concord lounge has an Elmis spa attached to it with free treatments for First class flyers. I booked in for the firm up and fly facial which came with a chair massage - be warned - the chair is a bit aggressive. I thought it was going to swallow my legs whole at one point. But the massage was so relaxing and my face felt amazing afterwards. Once you get onto the the plane, the lighting becomes absolutely terrible so all my photos from here on out area bit more shoddy than before. I'm a truly terrible blogger! I blame the 'night flight' lighting. Okay! First up, look at the space you get. For someone who thought the leg room in World Traveller Plus was lovely, this was a bit of a dream! Not to mention that we got a fab little Liberty amenities kit and some PJ's. The PJ's are such a great touch as it means when you get in to bed you're not in your travelling clothes so you arrive looking fresh! There's also an abundance of that Grand Siecle we had in the lounge on the plane! Dinner on the plane is served at a table with a little table cloth, salt and pepper pots and butter dishes, along with proper cutlery. We didn't eat much on the flight because it was a night flight, and we'd made sure we ate in the lounge (Jim's thoughts are that no matter how nice the food on the plane sounds it's still heated in a microwave). I chose a mushroom dish for mains, and Jim had the lobster mac and cheese. Both were lovely and a massive step up from the plane fare I'm used to! And then lets talk about the bed, with the duvet and the pillow and all the leg room to lay down and sleep. As we flew quite late, and had a 7 hour flight, we managed to take advantage of the bed. The cabin crew come and make the bed when you're ready for a nap, and even though we were flying with the sunlight, the Liberty kits have a lavender scented eye mask in them so sleeping is easy! I'll be honest, I busted the eye mask out a couple of other times on the trip and I might have pinched Jim's for further adventures! I think I embarrassed myself a little asking the cabin crew for some water whilst waiting to change out of my PJ's, then telling her where I was sitting, like there weren't 12 of us in the cabin! I just didn't like to presume she knew who I was! She was lovely about it, but I felt a little like a complete first class noob! Which we all know I was, but they don't need to know that do they? So, here was my first class experience - I thought it was really awesome. 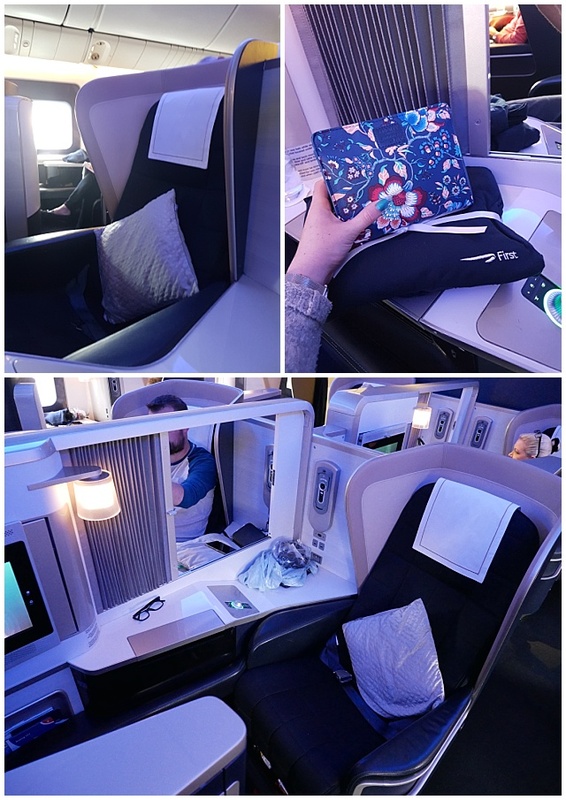 I know that I was really lucky to be able to travel first class, and I'm even luckier to already have another first class flight booked - San Fran here we come. But maybe next time I'll be able to get some better photos!